Welcome to Studio Twenty-Seven, our long-arm quilting department. We are pleased to announce the arrival of Stella Joy to Pressing Matters Quilt Shoppe. She is a 26” Optimum Gammill Statler Stitcher with a twelve foot frame. She can easily accommodate a king size quilt or anything smaller. Stella is programmed and operated by our conscientious and talented Joni. At this time we are able to quilt numerous edge-to-edge designs that will compliment your quilt. Joni will be happy to meet with you personally on Tuesday, Wednesday, or Thursday. 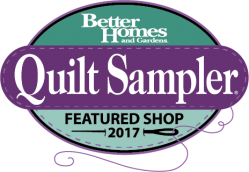 Of course, Kelly or any of the Pressing Matters Team can also help you choose a quilt design, thread color, measure your quilt, and give you an estimate. We charge our area’s industry standard of $.02 per square inch for an edge-to-edge design. Intricate designs are $.03 cents per square inch. It is super easy to estimate the cost of quilting for your heirloom. Simply multiply length X width. Then take that number and multiply it by $.02 or $.03. You may bring your own batting or you may use ours. We use Hobbs 80/20. It is eighty percent cotton and twenty percent polyester. We find that the loft beautifully shows off the quilting design without over poofing the quilt. Before bringing your quilt in to be quilted please make sure the top is squared up, the threads are trimmed, it is free of holes (even tiny ones where the seam did not quite meet up) and it is freshly pressed. We will be happy to press it for you but there will be an additional charge. We require that your backing be at least 3” larger than the quilt top on EACH side. The backing must be pressed and ready to put on the frame. We will piece the back for you at $10.00/seam.